Earlier this evening the last ever pot with a 50 cents jackpot contribution was dealt on the Party Poker network, bringing to an end over a decade of the lottery promotion and its contoversial extra rake. The statistically improbable (1 in 156,250 by some calculations) situation where one unlucky player loses with Four of a Kind 8s, or better, played out for the final time. The winner of the hand, loser, and rest of the table all received their percentage shares of the jackpot prizepool as normal, but then had to leave mid-hand. 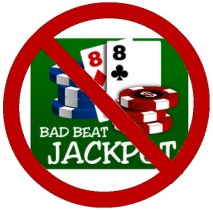 Every Bad Beat Jackpot table in the lobby was subsequently removed, across every game type and stake level. The change affects all room skins, including WPT Poker. It’s not yet known what was done with the 20% portion always used to ‘seed the next jackpot’. Party Poker has not yet made a public statement as to why the lottery scheme was removed. The network has always offered more gambling-oriented platforms, with casino, bingo and sports betting software advertised alongside its poker clients. This move comes ahead of a planned merger of the bwin and PartyPoker networks’ player pools. One speculation could be that the gaming group Bwin.Party wishes to present poker as more of a skill game, with a view to re-entering the US market as a major player once legislation passes. Party also removed all 20bb shallow tables some nine months ago, which were hard to beat for a positive winrate post-rake. Another possibility is that not a high enough percentage of Party’s players were winners, as a direct result of the extra rake in the jackpot drop. BBJ tables had extended to as low as 25NL 6-max games. The extra $0.50 taken from each pot was crippling to winrates, lowering them by several bb/100 and making it harder for recreational players to turn a profit. A 10% ‘admin fee’ taken from every prizepool ensured that playing at BBJ tables was -EV for everyone failing to hit the jackpot in their lifetime. According to a eGaming Review article yesterday, Party is said to be developing their own fast-paced Rush/Zoom product. Recently introduced on PokerStars, players can grind up to 1000 hands/hr four-tabling this type of ring game. Once introduced, Rush cash games could have a dual effect of allowing Party to recoup lost profits without the depleting effect of jackpot rake being made more obvious by the increased speed of the games. Rakeback.com will have more on these stories as they develop. If you haven’t checked it out yet, we also put together an exclusive Party Poker Strategy Guide for our players. In an email to players, PartyGaming has cited a desire to ‘ensure a healthier poker room, offering you better cash games and more players to play against‘ as their reason for removing the jackpot, and promises more great promotions in the pipeline.